With all the parts cleaned and treated its time to put this little lot back together again. You can see the colours of the springs just about, the yellow spring has lots most of its colour. The cleaning made sure that most of the colour came off. NOT that I wanted the colour to come off, but treatment is treatment and the colour did come off. All the springs are different designs so you can’t mix them up. During the clean up and treatment I made sure that all the right hand side and left hand side were separated for consistency. During the treatment I noticed the shoe locating pin was bent on both sides, that was soon sorted out by a few adjustments via the vice! I laid all the parts out to see what I had and where it went, the wheel cylinder went in first and then the shoe locating pins. The next job was to put Copper Ease in place where the shoes were touching the rear backing plate, in fact I added it anywhere metal was touching metal. Add the pistons into the cylinder seals and ready for the shoes. Just for the pictures I added the self-adjusting parts and the cable guide just to show the location, I removed these while I put the shoe locating springs in place. The shoe retaining springs were a pain as the springs require the top retaining platelet to be 90 degrees to the top of the flattened pin head to stop the retaining plate coming off. Next was the self adjusting cable to the bracket at the bottom, this goes on first underneath the springs at the top. I then added the leading edge spring followed by the trailing edge. At this point to put the spring on I used the Sealy tool, you simply hook the spring around the shaft, put the base over the central pin and straighten up. The spring slides down the bar over the central pin, twist the bar out and job done. Ten seconds and no effort to add the spring, same principle for the second spring. The bottom spring is a different, I used another specialist tool that unscrews at the end to a reveal a vice jaw that fits over the spring, twist the handle to lock it in place via the thread. Once firmly clamped just pull the spring to the self-adjusting bracket. Last job was to add the center plate to the middle, make sure the longer bolt is in the correct place for the spindle. I then repeated the mirror image of the left side to complete the front drums rebuild. Totally agree, there are many cars and instruction sets that dont have it at all. Many restored cars dont have them after the rebuild as you say. If you got it, use it, it was put on their for a reason at some point. Thanks for pointing that missing spring out and a good point, the reason is very simple, they was worn very very thin and would eventually broken. They are not always refitted. Ahhh, well that makes sense. I am in the middle of rebuilding front drums on my 65 and noticed it. Looking through various sites and walk throughs there are a lot of setups that don’t have that particular spring at all. And the only time I really see it referenced is on the rear brakes. I was just curious since mine had it and I didn’t see it back on your rebuild. All of the rebuild kits I had to choose from did not have this spring included. Mine is in great shape, so not an issue. 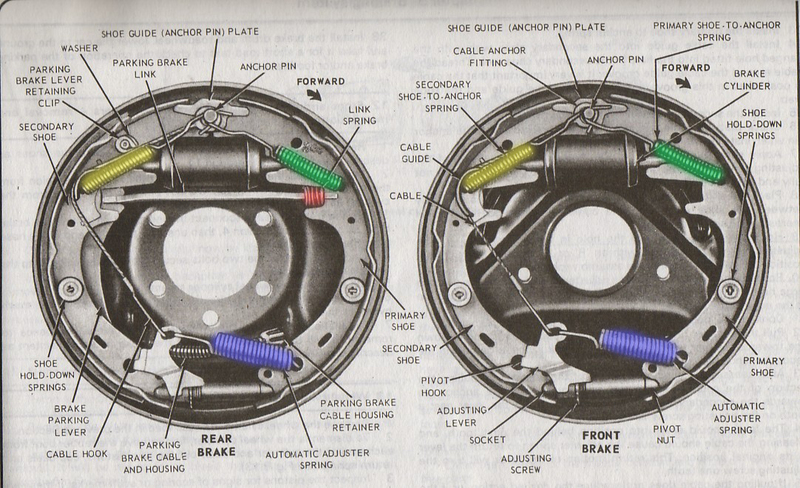 I noticed that when you had reassembled the brakes that you did not add the link spring back that runs across and under the wheel cylinder. Is there a reason you did not add this back?